Wendy is a licensed independent social worker with the ability to diagnose and treat a wide range of disorders using therapeutic interventions. 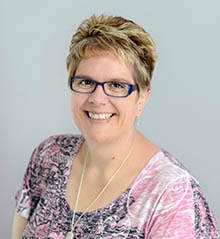 Wendy received her master's degree in social work from The Ohio State University and received her MBA from Ohio Dominican University before co-founding Providers for Healthy Living. Wendy has experience working in intensive outpatient programs, conducting individual and group therapies, working with families, and working with the courts. Wendy has worked with children, adolescents, adults, and families in a variety of settings. ​Wendy specializes in cognitive behavioral therapy, trauma-focused therapy and hypnotherapy to address mood disorders, anxiety disorders, post-traumatic stress disorder, conduct disorder, oppositional defiant disorder, family conflicts, and dealing with sexual acceptance and coming out issues.